Proficy HMI or iFIX (legacy DMACS) SCADA developed the first SW embedded driver for Motorola First FEP SW called IGC/M more than 25 years ago. Today iFix supports Motorola RTUs based system by OPEN & STANDARD protocols or via dedicated IP Gateway driver based on OPC Technology. 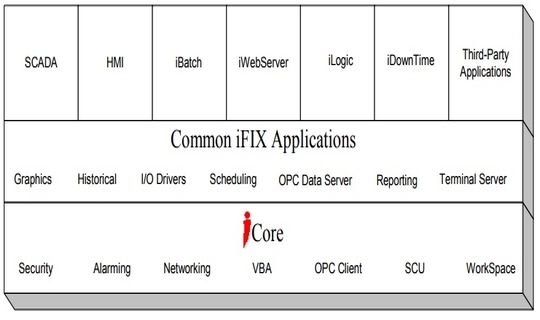 iFix is an open architecture with scalable and distributed networking model. Proficy is a foundational platform enabling Work Process Management, Advanced Analysis and top operational platform for operator and management teams. Unlike Wizcon, iFix has dedicated off-line editor for building the HMI screens. On the other hand iFix has one of the best, rich and friendly HMI graphic editors in the SCADA SW market. iFix is used worldwide covering all SCADA markets and industries. iFix enables easy HMI operation through secure and safe operations of plant floor while improving and automating decision making process resulting in an increased accountability and productivity. iFix platform lowers total cost of ownership through reduced programming, configuration and training time while improving operations efficiency and acceptance. Building on a track record of success and continual enhancements, the latest release of Proficy HMI/SCADA – iFIX from GE Intelligent Platforms is here and takes SCADA to the next level! iFIX is a superior proven real time information management and SCADA solution, which is open, flexible and scalable. It includes impressive latest-generation visualization tools, a reliable control engine and more! Like never before, this best-in-class supervisory monitoring and control software enables you to drive better analytics and leverage more reliability, flexibility and scalability across your enterprise.